High-fidelity simulation in neonatal and paediatric transport gives you the opportunity to develop your skills in the transport of high-risk neonatal and paediatric patients, allowing an exchange of experiences, ideas and knowledge with other participants around the world. It will also enhance your performance in critical situations through the skills acquired in crisis rosource management in a multidisciplinary enviroinment. 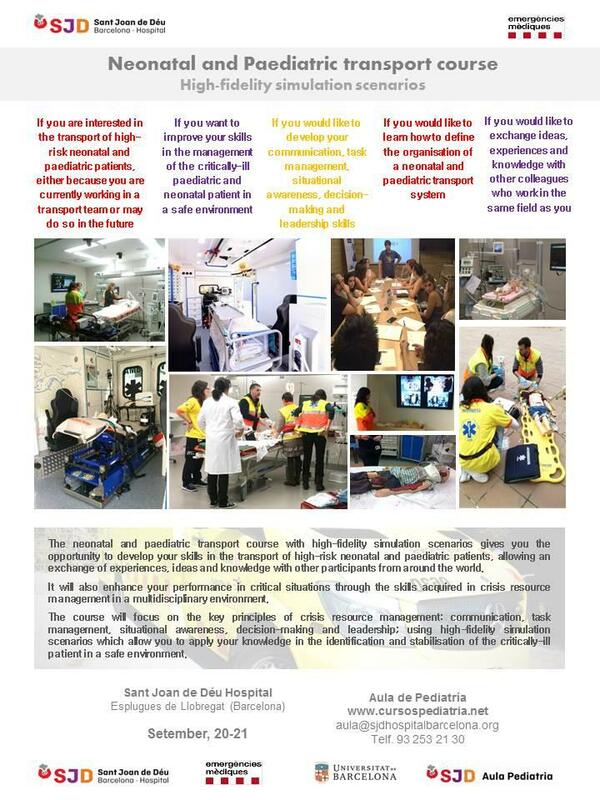 This course will focus on the key principles of crisis resource management: communication, task management, situational awareness, decision-making and leadership; using high-fidelity simulation scenarios which allow you to apply your knowledge in the identifcation and stabilisation of the critically-ill patient in a safe enviroinment. Introduction to the simulation. Darwin simulation space. Crisis Resource Management. Darwin simulation space. Neonatal transfer workshop. Darwin simulation room. Paediatric transfer workshop. Watson room. Simulation Scenario 1. Darwin Simulation room. Simulation Scenario 2. Darwin Simulation room. Simulation Scenario 3. Darwin Simulation room. Simulation Scenario 4. Darwin Simulation room. Simulation Scenario 5. Darwin Simulation room. Simulation Scenario 8. Darwin Simulation room. FEE: 700 € Register before July 16th, 2018 and get € 50 off. Introducing the NPTR15J code as a discount coupon.